How do I add team members to my Business account? Go to the "My Account" page using the "My Account" dropdown on the upper right corner. Click on "My Team" on the left to view your team's page. 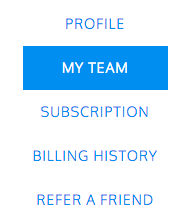 Add your team member's email using the text box and click on "Add Team Member". You can add new users or existing users. New users will receive an email with a link to create an account. If you receive an error that states "You have exceeded the account user limit," you need to add additional subscriptions. Click on "subscription page" to add more subscriptions.